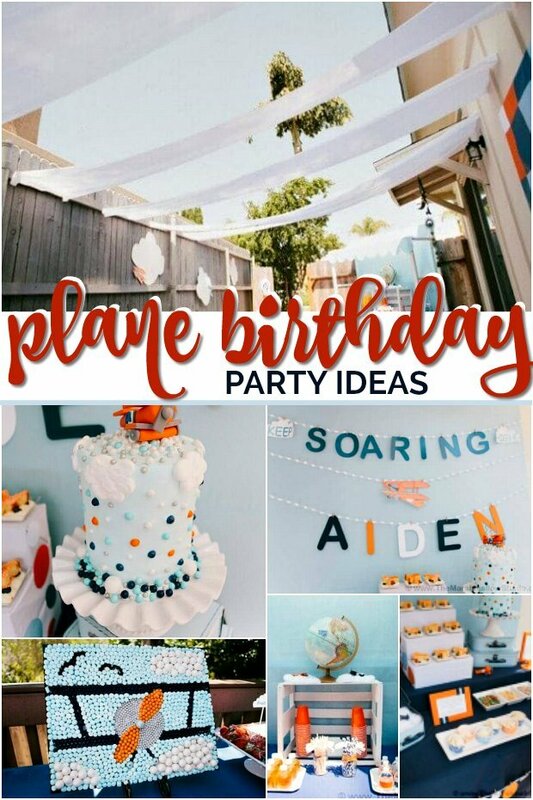 This plane party was thrown by Alejandra Morin of The Marshmallow Studio for her three year old son’s birthday. 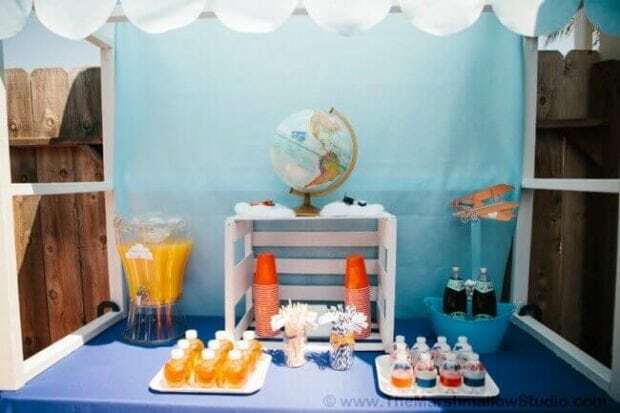 There are so many wonderful ideas that make vintage airplanes the perfect theme for her boy’s party including a gorgeous dessert table, adorable birthday cake as well as a cute drink station and favor baggage claim area. 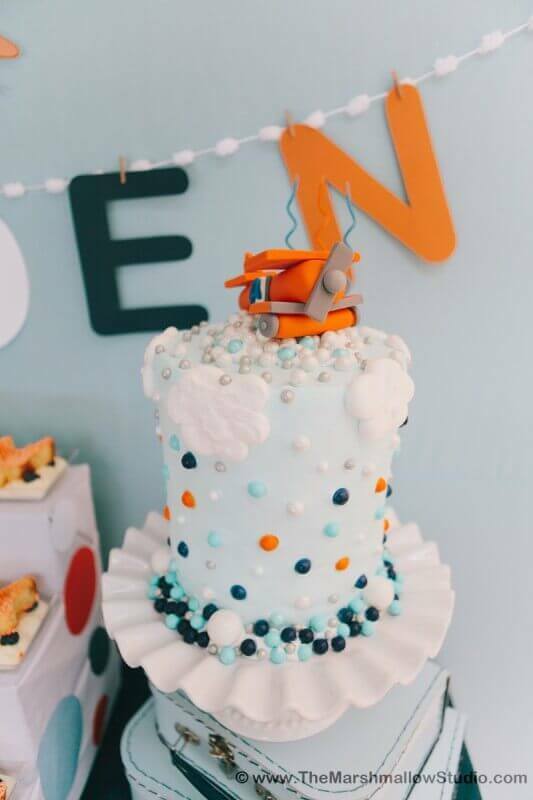 Fly the sky above with this Flying High Airplane Birthday Party. 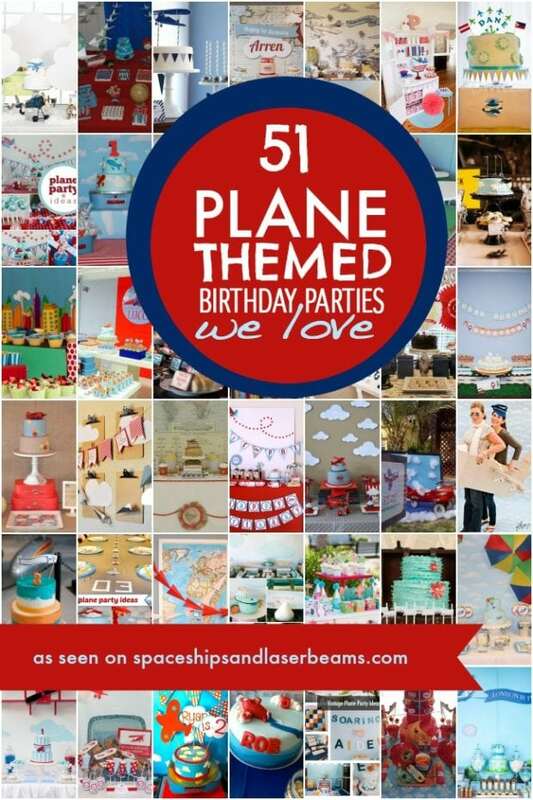 You do not want to miss out on this Paper Airplane Birthday Party. 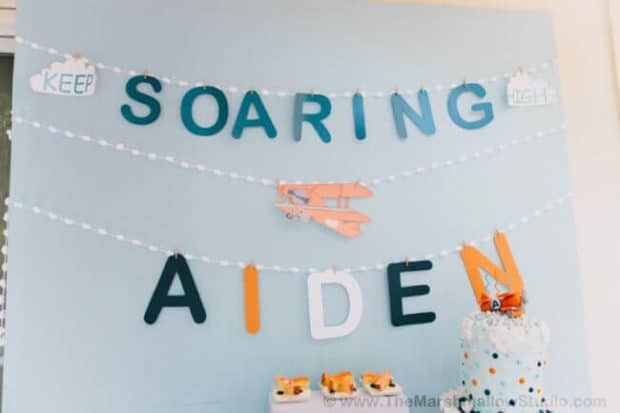 Not only was it her son’s birthday party, it was his graduation day party as well — so her theme of “soaring high” was perfect for the event. 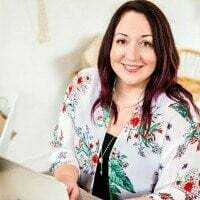 Alejandra chose a airplane theme for two reasons: her son loves airplanes and they would also symbolize his high accomplishments and ambition. Alejandra says, “We were celebrating the successful completion a full year of speech and applied behavior analysis therapy. He worked so hard to learn new things, learn to talk and modify his behavior and at times I couldn’t bear to see him struggle and become upset day after day, but we knew it was for his best. As the end of this therapy term neared, which coincidentally would be right at his 3rd birthday, it was clear to us he deserved a big party complete with sweets, pinatas, family and friends! Seriously, how awesome does the backyard look? 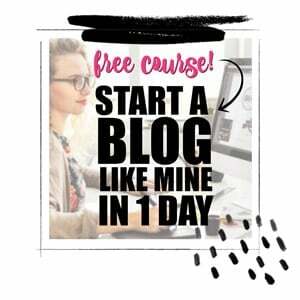 She ordered bi-planes and clouds in two different sizes and colors. 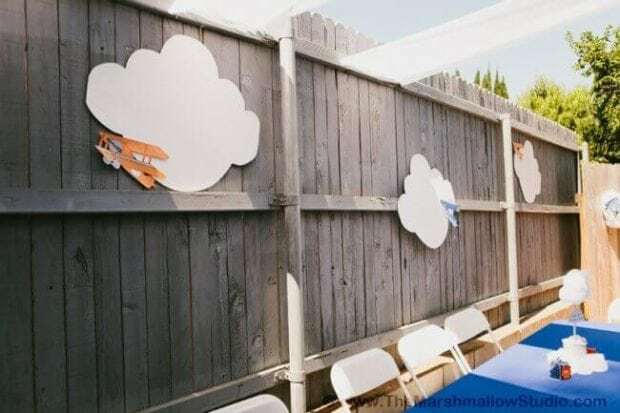 The large airplanes were mostly hung all over the side fence next to cardboard clouds, a couple were used to decorate the various stations and one for the wreath hanging by the entrance. 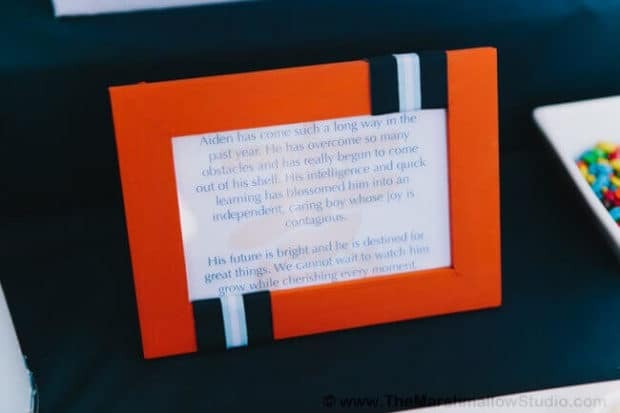 The tiny airplanes were used on the invitations, the centerpieces, the favor boxes and on food sins. 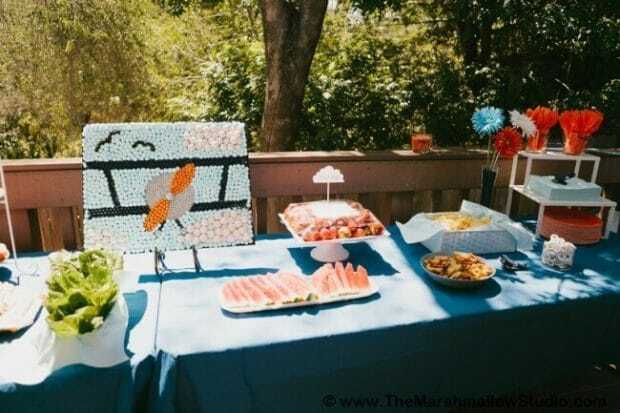 The clouds were used to make the centerpieces, dessert table backdrop and food signs. 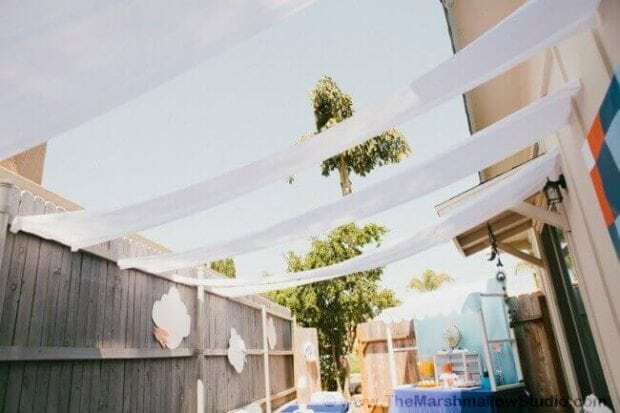 This huge canvas was an awesome focal point for her outside decor. 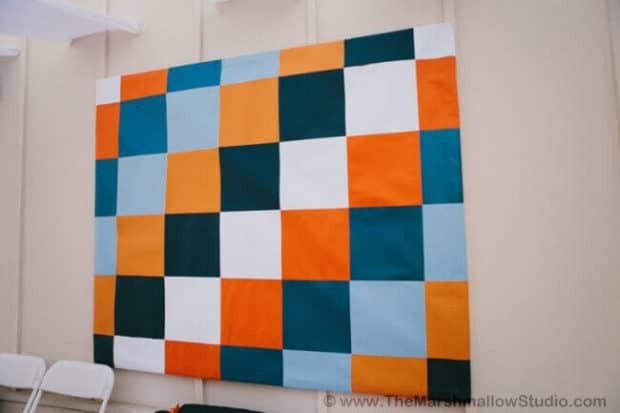 She used orange, white, blue and sky blue scrapbook paper and put it on a large sheet of canvas. The whole thing was stapled to a frame and then mounted to the wall. It now hangs in her son’s room. The centerpieces were cloud topiaries inside a tin full of white pearl gumballs. 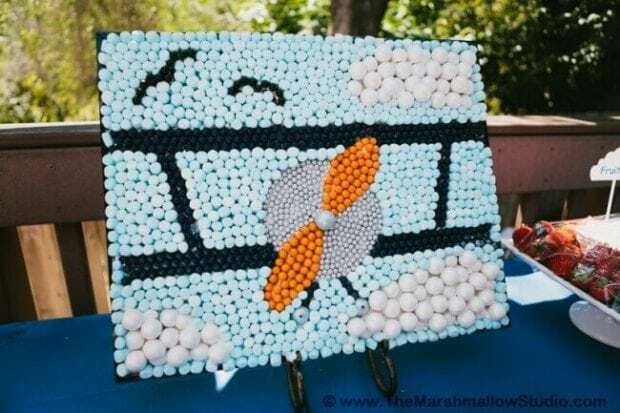 This party has some great touches but my favorite piece has got to be this edible biplane art made out of sixlets, gumballs and marshmallow just for this party. It’s spectacular. At the drink station, she removed the original water labels and wrapped the bottles with orange and blue duct tape. 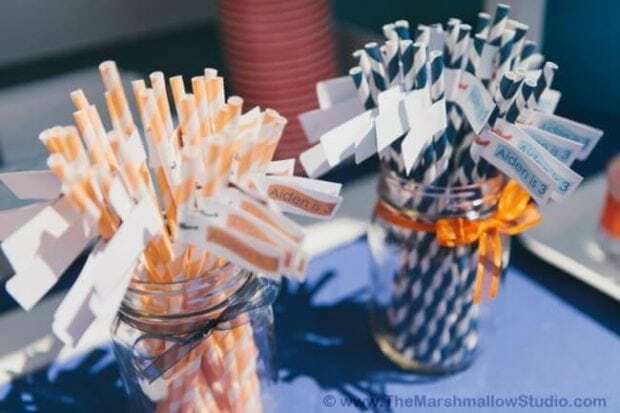 She also attached flags to the paper straws and put them in pretty decorated mason jars. 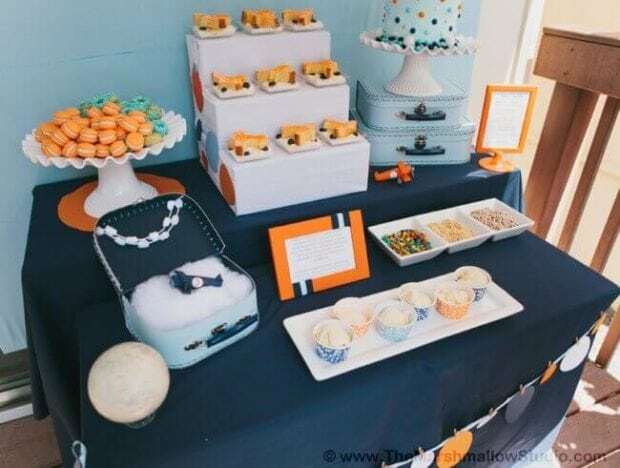 Sweets on the dessert table included mini orange vanilla cream macarons, tiny doughnuts, pound cake airplanes. 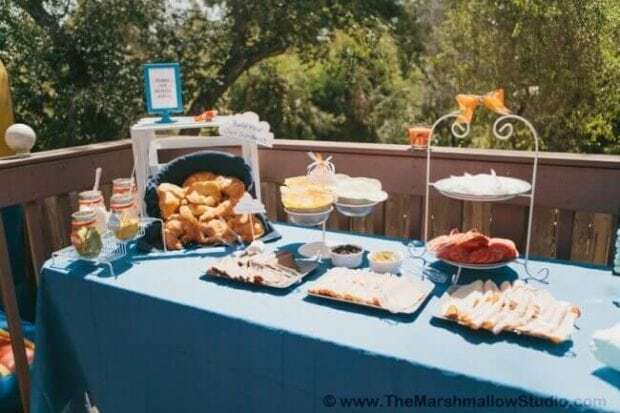 A fun ice cream bar was also offered. If you want to have an ice cream bar at your event, make sure it includes this recipe for hot fudge. It is THE BEST.